TALENT! is an ongoing exhibition series featuring graduate works from the world’s leading art and design schools as part of New York Textile Month. Housed together with EILEEN FISHER‘s exhibition “Circular by Design,” this pop-up exhibition features students from Parsons School of Design, Pratt Institute and Kent State University. The variety of textile talent showcased is a comprehensive reflection of young textile creativity today and the world at large. This is the second year students from the Pratt Interior Design Department have been asked to create a knitted room along with furniture that speaks to innovations in textile thinking. The exhibition highlights work from the students in Pratt’s Design Options Lab, Soft Construction Spring 2017 taught by Pratt Institute’s Annie Coggan. Working with soft materials versus hard gives the students a new perspective to design. 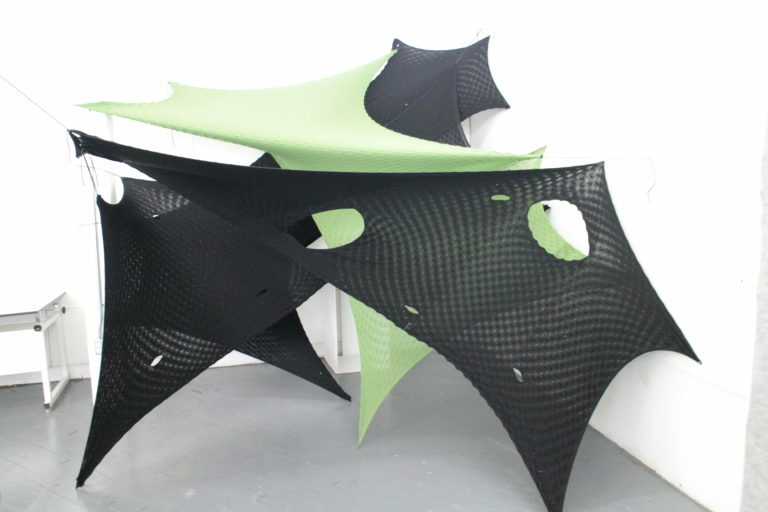 “I think they are apt to be more responsive to the material at install. They now know that how the knitted material behaviors at this scale is often unpredictable so staying loose and improvising is now built into the design process,” says Coggan.